It’s getting within shouting distance of Spring, which means that there’s rain instead of snow currently tapping at the windowpane behind me, and I’m starting to get itchy about spending all day in the 10x40 ft space we’re calling our home. One thing about being in New York is that there’s several lifetimes of things worth seeing. And since this is, ostensibly, a travelogue, or at least it started out as one, and I’m committed to keeping it that way, I want to get out and see more of the city. 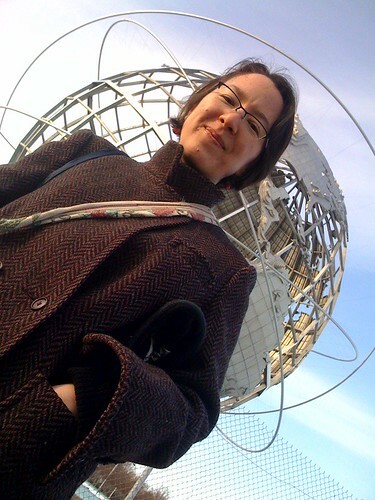 On Saturday K. and I got up bright and early and, after a couple false starts and a long detour at one of my favorite coffee shops we trekked out to the Queens Museum of Art, by the old 1939 (& 1964) World’s Fair fairgrounds. There’s not much left from the fair: a giant steel statue of the world, and a couple once grand-looking buildings made of concrete, that look like the past’s idea of the future. 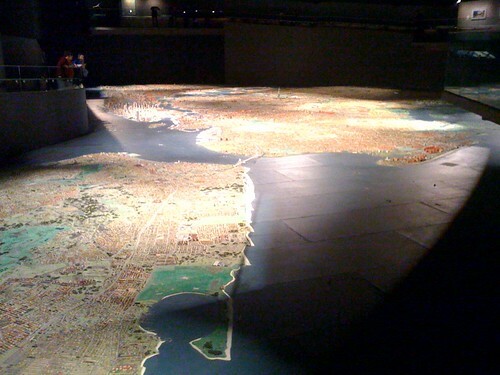 But the museum is a real hidden treasure — the centerpiece of the museum is a scale model of all five boroughs that takes up a huge space. 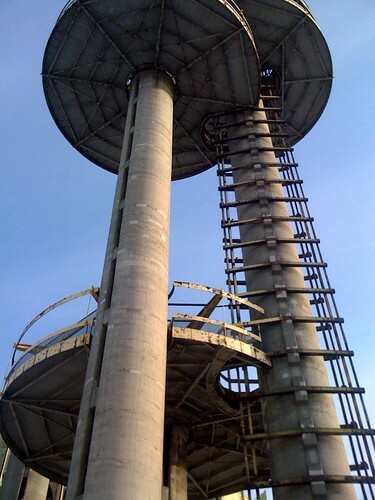 It was built, apparently, in 1939, and for a time they thought it might be used for city planning. They’ve done a fairly good job keeping up with all the changes since then (the twin towers are still standing in that little world, but I think there are plans to recreate the memorial, once the real one is finished) and K. and I had fun finding our little street (our building was nearly impossible to locate) and K’s workplace (a little easier) and NYU (fairly simple) etc. To give a sense of scale, the twin towers, by far the tallest actual buildings in the room, were about ten or eleven inches high. 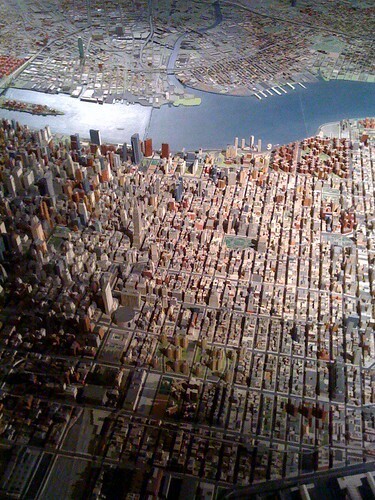 The model was about fifty feet east to west, and longer north to south. They even had little planes on strings taking off and landing at LaGuardia (not JFK, however, which seems like the opposite of my experience). What I noticed about the map was just how much of New York there is to explore. Good thing Spring is coming.